Here's the story: We were sitting on the couch this morning watching "Happily Ever After: Fairy Tales For Every Child" DVDs. (Huge shout out to these re-visioned old favorites. They are multi-cultural and sometimes gender-flipped. For example our first DVD was "Robinita Hood and her Band of Merry Chicas!") While I was drinking my first cuppa, he was barking out orders --"Take out the yellow one, put in the blue one!" -- and, in the manner of three-year-olds everywhere, picking his nose. I looked over at him inquisitively and he looked right back and said, "Big Booger." Which is the name of one of Ralph Stanley's banjo tunes! Fortunately Dalton's mother, Casey, is a Ralph freak and it is with her kind permission that I bring you this cute tale. Now back to the jams....We have been blessed with several beginning students this week. David, capo in hand, was back on Tuesday to continue learning the hard way that you can't go back and fix your mistakes while you are playing your break! But he tolerates my Evil Eye and Loud Guitar with a big smile. And already he is a better player, which is what the jams are all about. Gregg, attending his second Tip Jar Jam on Wednesday, played his newly-learned version of Banjo In The Hollow, and he found out as we all do that--say it with me--: "It sounds better at home!" But after playing it in his lesson and at the jam, the tune was considerably more cohesive. Susan, back from her new home in Florida for the Women's Banjo Camp, surprised the starch out of me (to use Mama's favorite "s" word) by singing last night! She chose I Saw The Light and said she wasn't sure of all the verses. I said, "Just remember what Bobby says: 'Wandering blind fool'." (Explanation: First verse: "I wandered so aimless..." Second verse: "Just like a blind man..." Third verse: "I was a fool...") I'm not sure that helped, but she did a good job! She kicked it off first in the Key of A, then realized immediately that that key was too low for her, so she bumped it to B. Just knowing how to change keys to accommodate your voice is a Big Deal, so I was proud of her for that. She also nailed that high, syncopated Scruggs ending on Lonesome Road Blues. As she reminded me afterwards, "That took two years for me to learn!" I hadn't forgotten. Bob A was the only G singer in the group last night, so I worked him hard. He rose to the occasion like a champ, pounding out his lead guitar breaks in a manner that pleased even my persnickety self. As I told him, he did all the right things: He played in time and he played loud enough for us to hear him. Equating praise with a Soft Heart, he immediately asked, "Can we do Jimmy Brown The Newsboy?" Susan responded with a "Yeah!" which I parried with "Wrong answer!" Then, to Bob, "No, you cannot!" Bob explained to the somewhat perplexed Susan that he and I have this "thing" going about the song Jimmy Brown. He loves the song (as do I) and has worked hard to learn the words and a guitar break. Still, I will not let him play it in the jam. Why not? Three reasons: He still has trouble with the timing; it's in the key of E, which is a hard key for a Beginning-Intermediate Jam; and being in E no one else can take a break. So ixnay on Jimmy Brown. Orrysay, Obbay. And I must brag on Kathy G again. She's been working hard on Roll In My Sweet Baby's Arms but she's never played it in the jam before. However, last night when Bob sang it she tore into Earl's break and nailed the first half. Then, having lost track of what "Earl done," she totally made up something else right on the spot! She did not miss a beat. I was grinning like a possum, I was so proud of her! There is a perfect example of learning Earl by ear, coupled with Roly Polys. It's the best of all possible banjo worlds! Red Toenails -- With Banjo! I will close with a picture, which is worth a thousand words. Crissy, who came from Canada to attend her second Women's Banjo Camp sang a really cool song last night, Country Poor And Country Proud. She did it in the Key of C which meant we had to wrestle with either an A minor (if we were capoed) or a D minor (if we were not). Somehow we muddled through. At the end of the jam, she showed off her toenails, which she'd had painted especially for the camp. 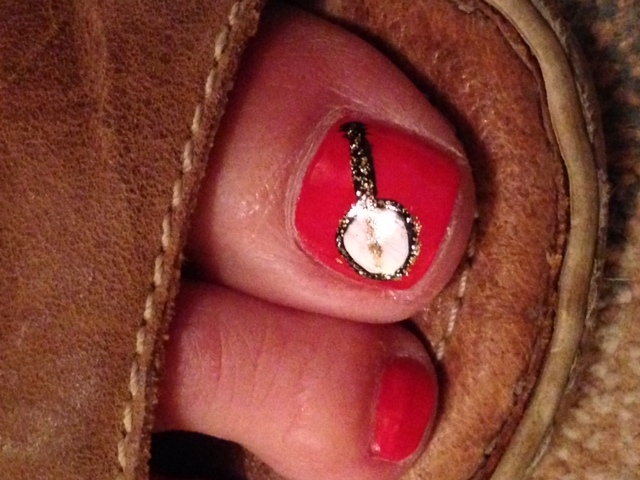 In case you can't tell, that's a banjo on her toenail! Never thought of that! (And I'll bet the Dixie Chicks didn't either!) You go, Crissy! Our second Women's Banjo Camp officially begins tomorrow, but we will be holding an Early Bird Jam for the campers tonight. Looking forward to all that C singing and estrogen harmony! Next week we will be jamming Tuesday (22nd) and Wednesday (23rd), 7-9. NO JAM on Tuesday July 29, as I'll be in Elkins, WV, giving a book talk and a concert at August Heritage Bluegrass Week. I'll be back in the saddle on Wednesday, July 30. All Murphy Method students, both mail-order and in-person, are welcome at the Tip Jar Jams. Suggested donation is $20. Y'all come! Posted in By Murphy, jamming, Learning By Ear and tagged tip-jar jam, toenails on July 17, 2014 by Murphy Henry. Really enjoy this blog Murphy,Ive received my mail for years through my wifes email,i don’t play much anymore,but I still have all the tapes I purchased years ago,maybe ill start playing again one of these days before my fingers stop working,occasionally I get out my dogwood #4 and pick a few tunes,just thought id say hi and enjoy the reading,thanks carl tyre s.fl.